This famous garden started with plantings from homesteaders during the 19th century and has continued to expand intermittently ever since. At 3000′ elevation in the Sierra, it usually opens in mid- to late-March – and lasts only a few weeks. It varies greatly according to the Spring weather. Contact the Business and Professional Association in Sutter Creek, the Amador County Information Center, or the California Automobile Association for information before you leave home. Daffodils abound at Filoli in Woodside. Fields, flowers beds, containers and more are in bloom from late February through March. For more information please visit this web site at www.filoli.org. The Amador Valley Garden Club and Alden Lane Nursery have been planting daffodils on one of Livermore’s oldest cemeterys. Be sure and visit this historical site in March! 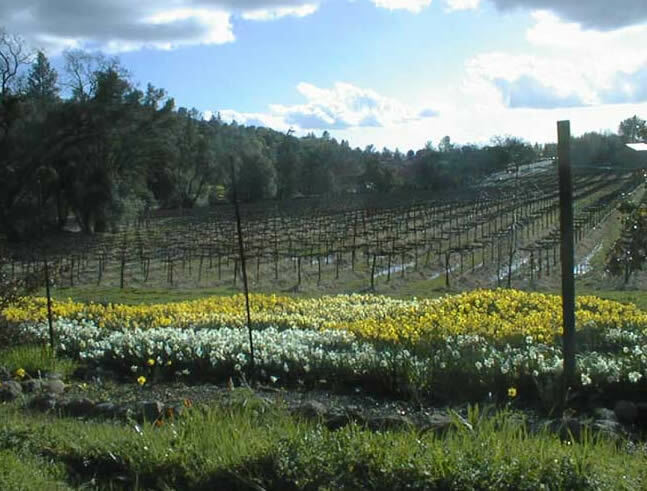 KIV has perhaps the largest planned landscaping of daffodils in California. One’s breath is taken away upon rounding the hill and seeing the daffodils blooming everywhere in front of you. The peak of bloom is mid-March; coinciding with Murphys Irish Days Celebration. The NCDS holds a daffodil show at KIV during this festival. KIV has extensive gardens; something major is in bloom at nearly any time in the year. Murphys is filled with boutiques and restaurants. Information about the community plantings throughout Oakland in parks and at key buildings. Over 100,000 bulbs donated and over 3,000 volunteered to plant the bulbs! Information about thousands of daffodil bulbs that San Jose is planting. Over 200,000 bulbs have been planted to date! Bill Welch grows several acres of tazettas. His business is providing cut flowers to florists. His fields are colorful wonders to see and walk through, especially since blooming time is November through February when other daffodils are dormant. Bill welcomes visitors if he’s not busy cutting and shipping. You must call ahead: 831-236-8397. You can make a lovely day by planning to visit Bill’s daffodils with a stop in Carmel or Monterey!